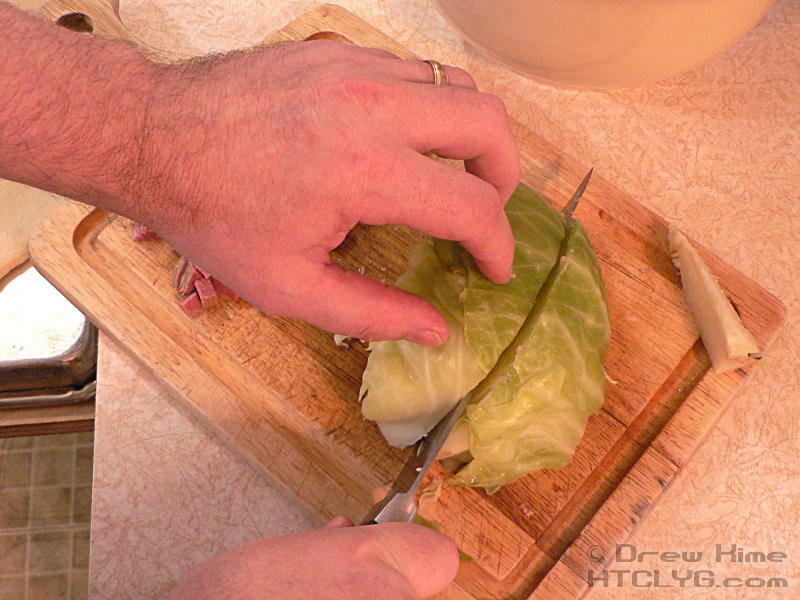 I’ve never seen a meal of corned beef and cabbage that didn’t generate leftovers. We’ve all done the basic corned beef sandwich, or maybe a Reuben. But sometimes you’re not in the mood for rye. 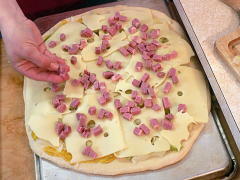 Or a sandwich. Or eating alone. 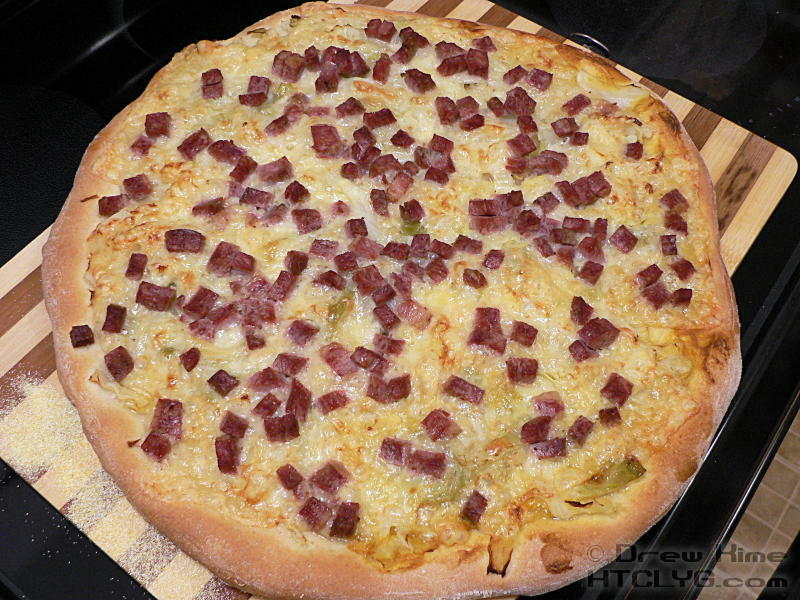 And is there any food more social than pizza? So here it is. 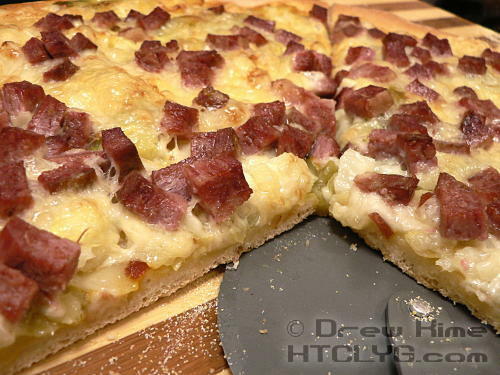 Corned beef pizza. 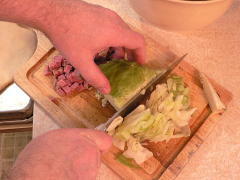 Normally I’d have leftover cabbage to go with my leftover corned beef, but we had brussels sprouts instead. If you’ve already got your cabbage, skip ahead to the corned beef pictures. Cut the cabbage in half through the stem, then each half into quarters, through the stem again. 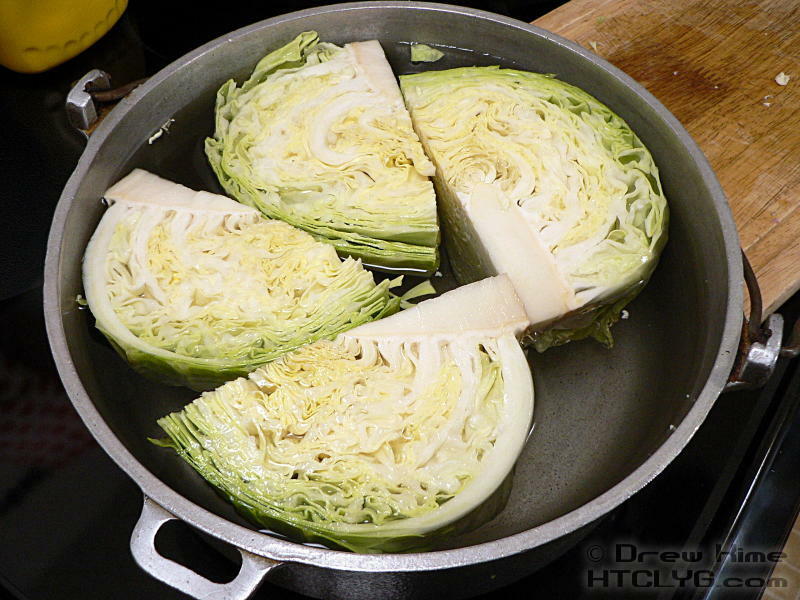 Place the pieces with the cut sides up — so you don’t get bubbles trapped inside — in a large pot, and add enough water that they float. Season with about a tablespoon or two of salt. When you cook it with corned beef it picks up plenty of salt from that. 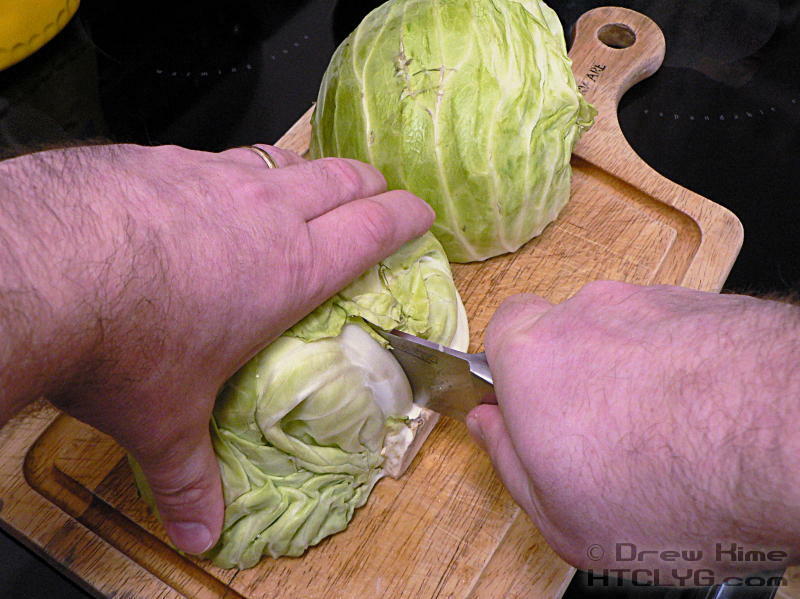 If you’re doing it by itself like this, it will be very bland without the salt. 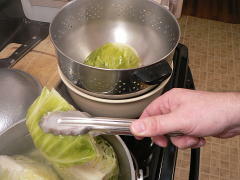 Bring to a boil, then turn down to a simmer. 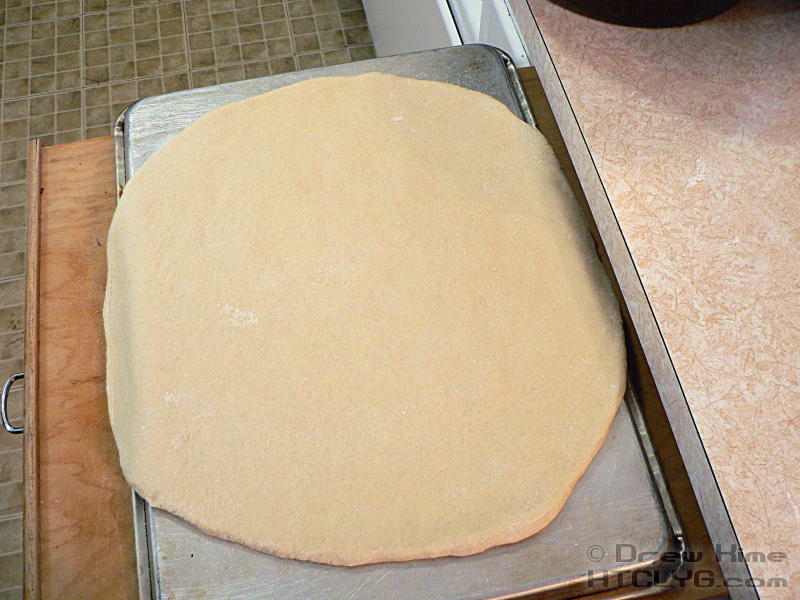 While that cooks, make your pizza crust. 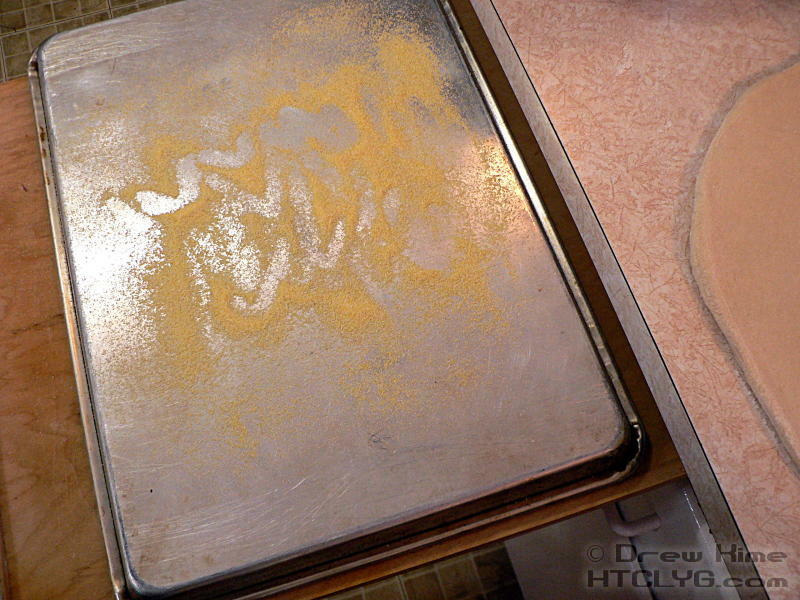 Dust a pizza peel — or if you don’t have one, the back of a baking sheet — with plenty of corn meal. Don’t skimp, you don’t want the dough to stick when you’re transferring it to your pizza stone. The cabbage is done when you can slip a knife through the core without any resistance, about 25-30 minutes. Remove the wedges from the water and allow them to drain for a few seconds. 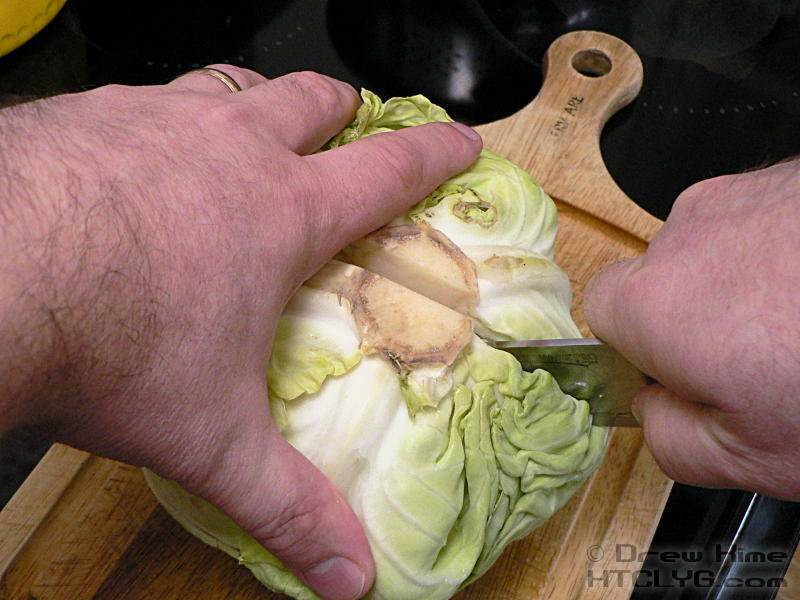 This is why you left the core in, it’s much easier to handle when the quarters stay together. 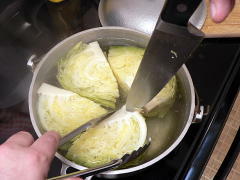 Place the pieces cut side down in a colander. 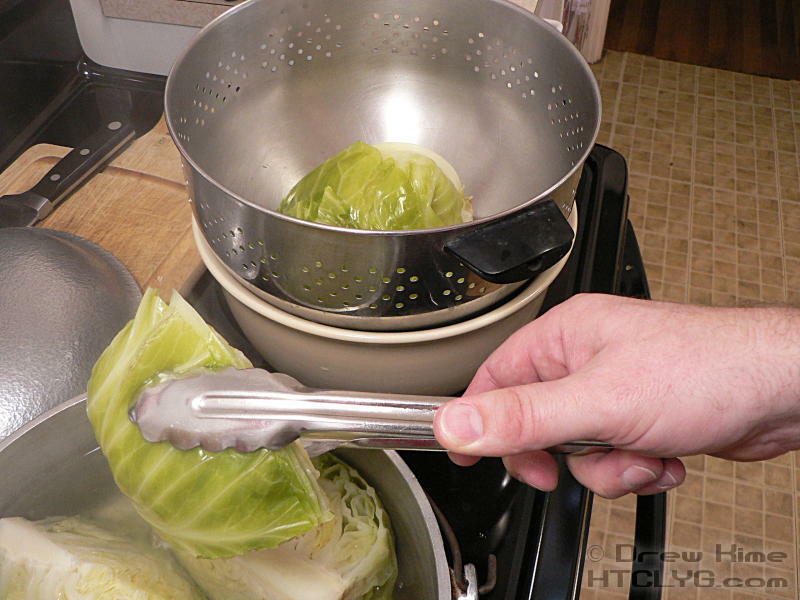 You can do this with the colander in the sink, but I prefer to put it over a large bowl. My sink and stove are on opposite sides of the kitchen, and I don’t like moving things that are dripping boiling water. 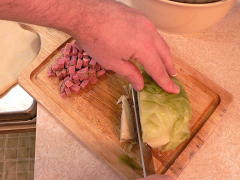 While the cabbage drains, trim the fat off the corned beef and slice it about a quarter-inch thick, then turn and cube it. 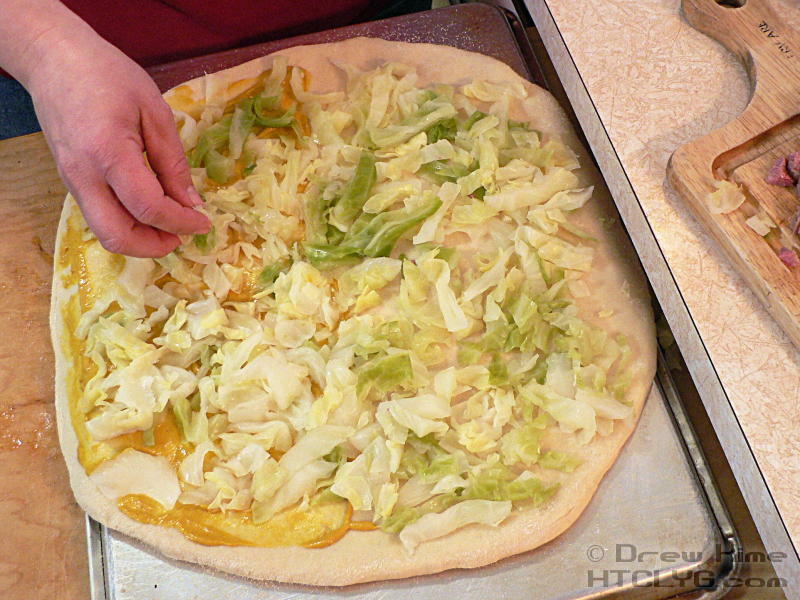 You don’t want to shave it like you would for a sandwich, or it will burn. When the cabbage has cooled enough to handle it, place one quarter cut side down and cut the stem out. 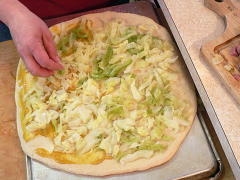 Then cut it in half lengthwise, and chop into shreds like you would for coleslaw. If you’re using mustard, spread it on the way you would normally use pizza sauce. 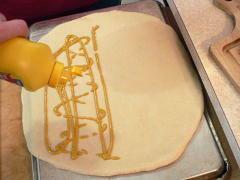 We did half-and-half, because the kids don’t like mustard. 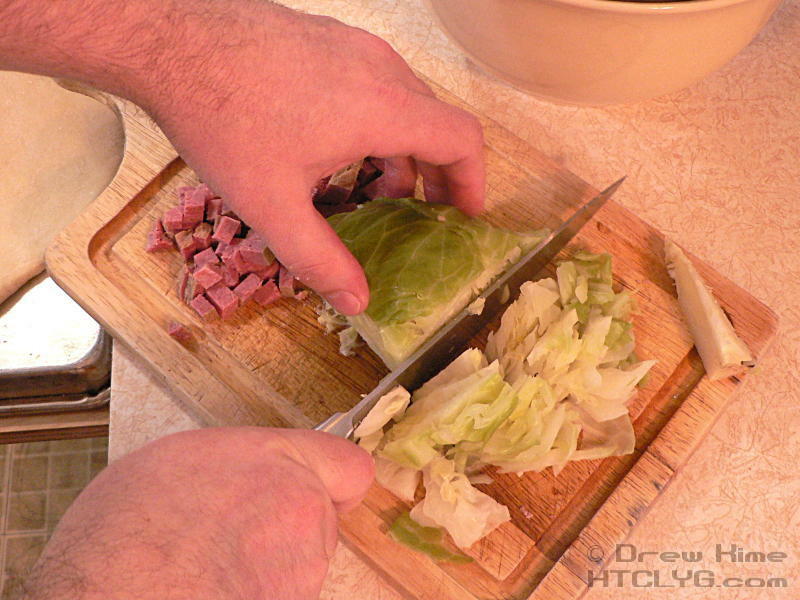 Top the whole pie with chopped cabbage, slices of swiss cheese, and cubes of corned beef. 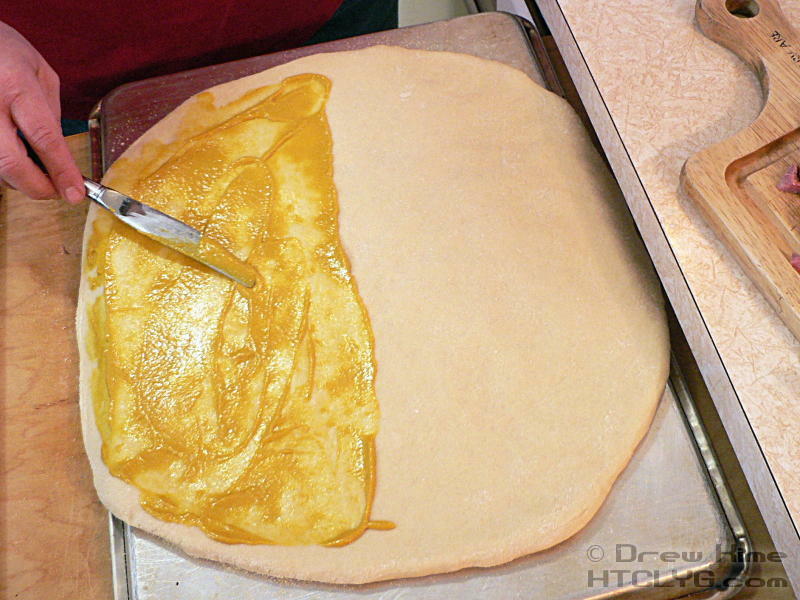 Transfer the assembled pie to the pizza stone and bake for 15-20 minutes, until the visible part of the crust is golden brown. Let the pie rest for about five minutes so the cheese doesn’t all run off when you slice it. Serve with more mustard to dip it in. 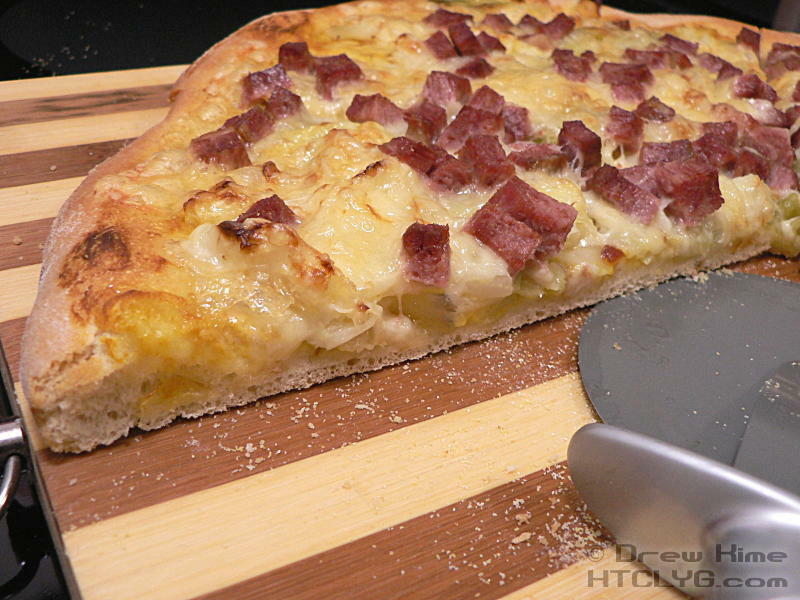 Come back the rest of this week to see an updated version of the crust, which I’ve finally got just right. 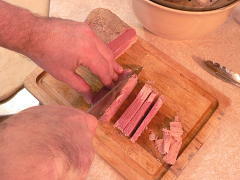 (Hint: It’s the same lesson I learned when I made the rye bread.) And the final wrapup of all the leftovers from the last two weeks. 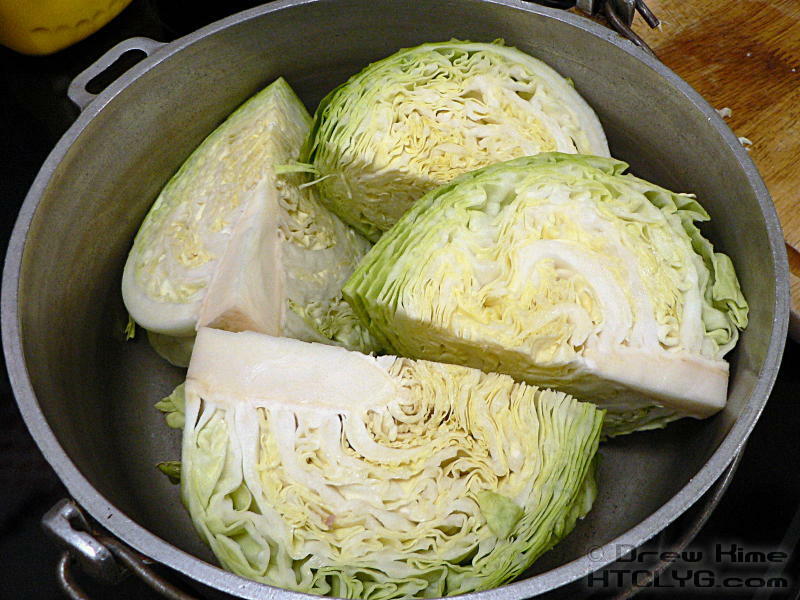 Quarter the cabbage (if you don't have leftovers) and boil in salted water until a knife goes into the core without effort. Drain and chop into thin strips. 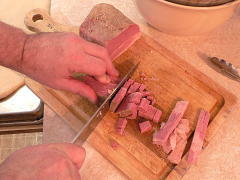 Chop corned beef into quarter-inch chunks. 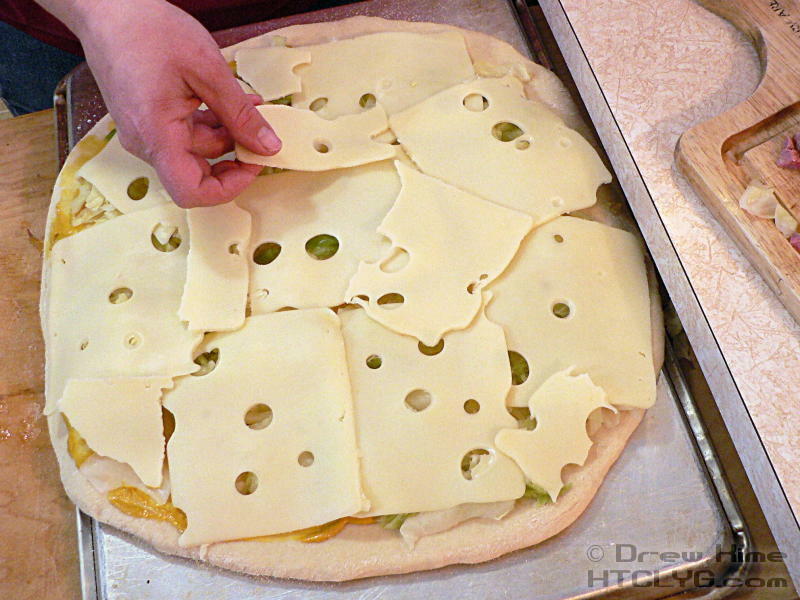 Don't use slices like from a deli counter or it will burn. Pre-heat the oven to 500° F. (Yes, that's not a typo, 500°.) 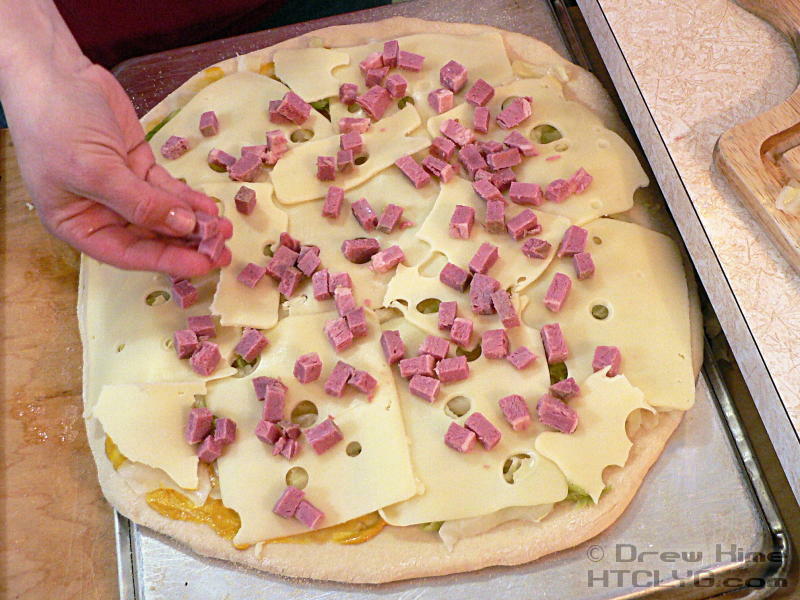 Top the pizza crust with mustard like you would normally use tomato sauce on a regular pizza. 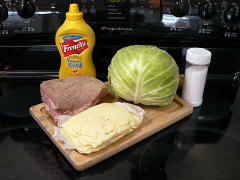 Top with cabbage, cheese, then corned beef. 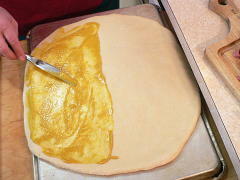 Bake for 15-20 minutes, until the visible part of the crust is golden brown.